This last May, we held our first live event. Authority Intensive featured a personally-curated group of speakers in a single-track format to a sold-out house, with an emphasis on the fundamentals of design, content, traffic, and conversion. I must say, it was a personal highlight of this crazy adventure we’ve been on since I started Copyblogger back in 2006. The privilege of having Seth Godin, Ann Handley, Darren Rowse, Joanna Wiebe, Bryan Eisenberg, and many other of my industry favorites speak at an event we hosted was both amazing and humbling. So naturally, I have a really high bar to exceed for the next show. Let me know what you think about this keynote group (which is just for starters). The feedback from the first show, which sold out months in advance, was phenomenal. The cool thing for me was that I got to choose the speakers and introduce each of them, simply as a fan – and the audience got all the benefit. You can see the highlights from last year here. In reality, however, all 2014 really did was embolden me to take my fan boy aspirations to the next level. Dan is the serial New York Times bestselling author of To Sell Is Human: The Surprising Truth About Moving Others, A Whole New Mind: Why Right-Brainers Will Rule the Future, and Drive: The Surprising Truth About What Motivates Us. And don’t forget Dan’s first bestseller, Free Agent Nation, which featured yours truly from my earliest days of content marketing in the late ’90s. Back in 2000, I was thrilled to meet Dan at the Magnolia Cafe in Austin to be interviewed for his first book, and now I’m exceptionally proud to welcome him as the opening keynote of Authority 2015. I can assure you that after his presentation, you’ll never look at “selling” the same way again. Sally is the bestselling author of Fascinate: Your 7 Triggers to Persuasion and Captivation and her latest How the World Sees You: Discover Your Highest Value Through the Science of Fascination. Sally rose to the top of the advertising profession writing ads that fascinated millions of consumers, and she now specializes in measuring how people perceive the way you communicate in order to find your winning difference. Sally’s presentation will focus on how to identify your unique positioning as a content creator. And the cool thing is that she believes the greatest value you can add is to become more of yourself. Henry Rollins — lead singer of seminal punk pioneers Black Flag, then later heading the breakthrough Rollins Band. Author and founder of his own publishing house, and an enthralling spoken-word artist. And then, naturally … print, film, radio, and television personality. So other than being the coolest thing ever, why is Henry Rollins speaking at a content marketing conference? Because content marketing is do it yourself media, and Henry has done DIY media in a way that makes us all look like slackers. Black Flag recorded, financed, and distributed their own records, set up and promoted their own shows, and created their own merchandise. Henry published his own books (nearly 30 at last count) on his own imprint, and toured the world multiple times as a spoken-word artist under his own initiative. And then he said “why not” to the world of traditional media. With all due respect to the late James Brown, Rollins remains the hardest working man in modern show business, and he will absolutely get you fired up about your own new media efforts. In 2015 the event is called Authority Rainmaker, for obvious reasons. And we’ve changed venue to the magnificent Ellie Caulkins Opera House in downtown Denver, Colorado, to accommodate a larger audience. There will once again be amazing food, fantastic parties, and exceptional networking. And naturally we’ve got some amazing hotel deals for you as well. 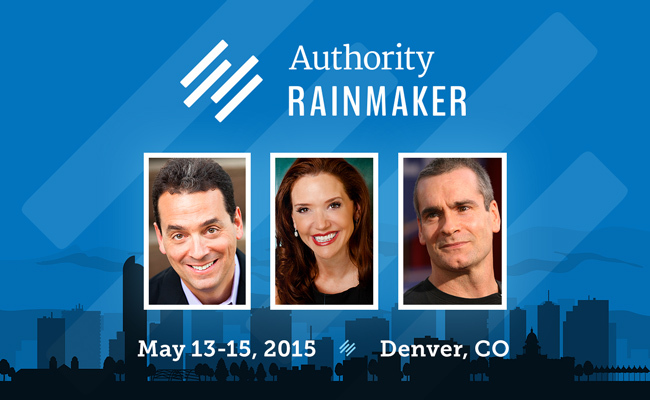 Reserve your spot at Authority Rainmaker 2015 today.